Rhoda Bryan was born on September 30, 1937 in Wilkesboro, NC. She earned her B.A. degree in English from Berea College in Berea, KY in 1959. 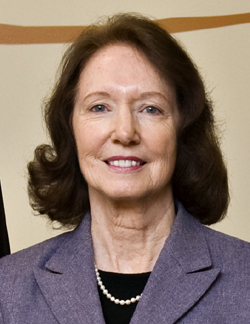 She earned her law degree from Wake Forest University School of Law in 1966, graduating first in her class. On October 2, 1959, Rhoda Bryan married Donald R. Billings; they have one daughter and one son. From 1966 to 1968, Rhoda Bryan Billings practiced law with her husband. Also, from 1966 to 1967, she served as a U.S. Bankruptcy Chapter 13 Trustee. In 1968, Rhoda Bryan Billings was appointed as a Judge in the newly-created District Court in Forsyth County. the rank of Professor from 1980 to 2003. & Wells, chaired the North Carolina Parole Commission, and served on the NC Supreme Court as an Associate Justice in 1985-1986, and as Chief Justice in 1986. In 1985, Governor James Grubbs Martin appointed Rhoda Bryan Billings as an Associate Justice on the NC Supreme Court, replacing Associate Justice Earl Wray Vaughn, who resigned on July 31, 1985. In 1986, Governor James Grubbs Martin appointed Rhoda Bryan Billings as the next Chief Justice of the NC Supreme Court, replacing Chief Justice Joseph Branch, who retired on July 31, 1986. She lost in the November 1986 General Election to James Gooden Exum, Jr. In 1991, Rhoda Bryan Billings became the first female President of the North Carolina Bar Association. From 2008 to 2012, Rhoda Bryan Billings served as founding chair of the Judicial Performance Evaluation Committee. The Judicial Performance Evaluation Committee, composed of lawyers, laypersons and retired jurists, delivered North Carolinas first comprehensive statewide evaluation of trial court judges. Appointed as Chief Justice by Governor James G. Martin in 1986. Defeated in the general elections of 1986 by James G. Exum, Jr.